Awwww, Princess Peach might not get rescued anymore. I hope they’re happy together. So long as, later in life, Mario doesn’t eat any of their kids to power up that is (I’m of course guessing that Toad is a sequential hermaphrodite) . The dialogue in this strip comes to you courtesy of my buddy Steve. We tend to have ridiculous conversations…this was one of them. I’d high five you if I could. Yeah, Michael wins the comment war. I’m not even going to try. I’ll stick with thinking he is always flipping me off. 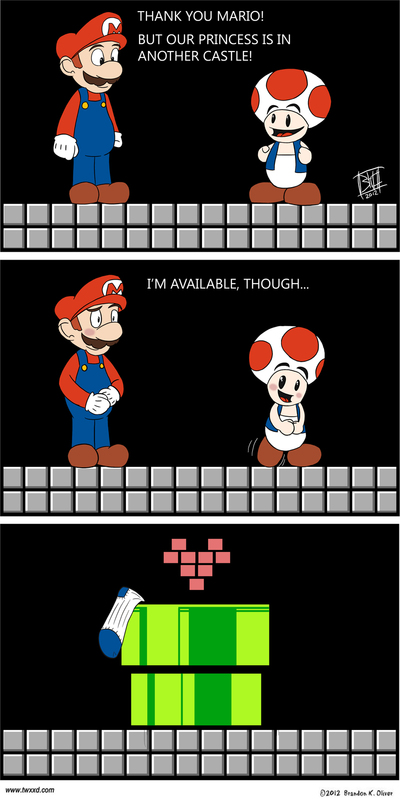 Toad’s probably still doing that…in a different way. This reminds me of the joke about the gay bar where the guy says, “mind if I push in your stool?” I find that joke really offensive. But then I think there’s a joke here about pushing in Toad’s stool. Toadstool? Get it? It’s not a mushroom it’s a toadstool? I hate myself right now. I love you even more now. Kids? I always thought Toads were male. It’s amazing how naughty pixels can be! Somehow I knew that Toad was a man whore. But Mario was really the only one for him in the end. That is one adorable human/mushroom couple! If that tube’s a rockin’ don’t come a knockin’!